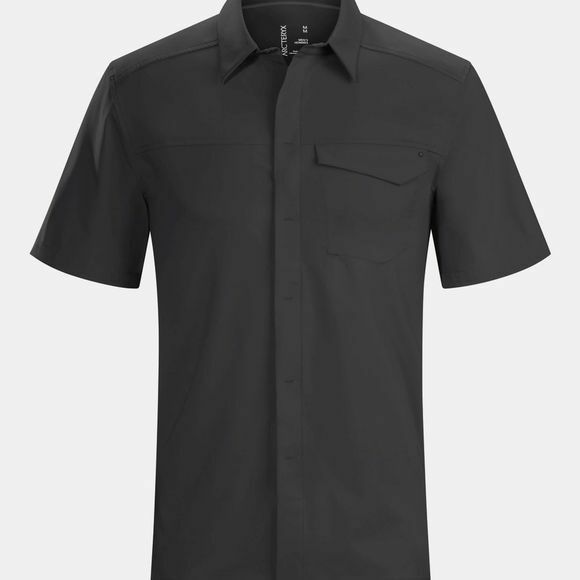 The Mens Skyline Short Sleeve Shirt from Arc'teryx is a light, trim fitting and quick drying, the Skyline Shirt Short Sleeve wicks moisture, looks good and stays cool. Classic button down style is updated with a hidden snap closure and contemporary architectural lines on the pocket flap. Articulated patterning, mechanical stretch and gusseted underarms extend ergonomic freedom, and the soft, airy Diem polyester fabric is highly wrinkle resistant, making the versatile Skyline a choice for travelling as well as work.